In the Enchanted Tarot the card that is often called the Ace of Cups in other decks, such as the Rider Waite, is titled the Ace of Hearts. As it happens, that was always my favourite in the normal playing card deck that I grew up with - my family played Double Pack Rummy as an after dinner game and I was allowed to join in from a young age. I don't know that it won me many rounds of cards, but I was always glad when it turned up in my hand! 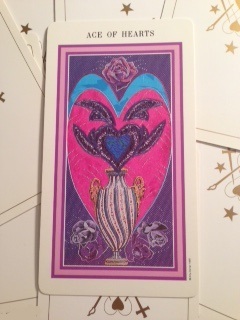 In Amy Zerner and Monte Farber's Enchanted Tarot the Ace of Hearts features the most beautiful colours: deep cerise pink, turquoise blue, teal, purple and lilac. There is a lace look to the tapestry in the background, featuring gorgeous roses, which gives is both the sense of something freshly cut from the garden and something preserved in time in a lace panel or maybe through cross-stitch. The deep pink that forms the larger section of the heart has a silk satin look to it, making this a very tactile card. It seems to belong in a lady's boudoir. There is a heart within this heart, with a decorated, striped urn or vase below and just behind, which reminds me of the Temperance card and all the water pictured there. Although there is no visible water in this card, the edge of the heart has a sea blue band and this Suit in the tarot is strongly connected with water - and its link to the emotions within us. To me this card represents the purest of feelings an particularly love. Sometimes we feel love through tears as much as through smiles and warmth. The heart is a powerful point of connection, human to human. It is our common denominator of life. It helps to pump the blood through our veins and the air through our lungs. The beating of the heart tells us we are alive, vitally so - and we are reminded of our frailty and the temporary nature of life should that heart ever stop. In a way, the heart and its emotions are the evidence that we are fully alive - and also the warning that, if we misuse what we have been given, it may hurt or stop altogether. I drew the card today as part of a reading about whether to try to let someone know that we are related - part of the same family. It's a slightly odd situation, because the person is very famous. I have been studying genealogy for quite a long time now and, through those connections, this piece of truth has shown itself. Why would I hesitate? Lots of reasons, probably, but including that they might be inundated with distant relatives contacting them! Perhaps they'll think it odd. Maybe the contact will be unwelcome - and maybe not, who knows. This card in the reading reminds me that this is the risk of opening up emotionally and reaching out to another human. The heart might get hurt in the process, somehow. Or you might raise someone else's blood pressure! Then again, the roses look like a gift here and they represent something precious and lovely. So maybe I will find the courage to open my heart and extend out to this person. The courage to show love, admiration - the chance to say "hey, well done you, for all you have achieved (because he has already done so much). For now I shall content myself with the peace of this card and its beautiful colours. I hope you enjoy contemplating it, too. The Tarot Log has been a bit neglected and I apologise for that. I notice that the post on the Hierophant seems quite popular - visitors do seem to read that (although maybe too shy to post thoughts - apologies if I didn't make the invitation to do so very clear!). Currently the log is taking a new turn and focussing especially on tarot for recovery work. That is, looking at tarot from the point of view of understanding the self at a deeper level and changing difficult patterns. The card of the moment is the Nine of Cups. This features a man who sits in front of a row of cups. He is well dressed and a little on the "tubby" side. His arms are folded in front of himself. We could say that the cups represent trophies - signs of his success. This tells us that this is a man who likes to achieve. He is ambitious. He has entered into things and come out successful. Or relatively successful, at least. 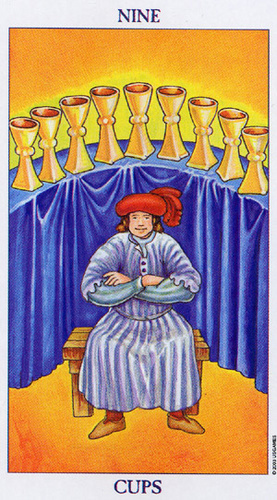 Those are nine cups after all, not yet ten - which is the number of completion in the Minor Arcana of the Tarot. To many people nine out of ten might be pretty good. But for this man it's not quite enough. It's not one hundred percent; it's ninety percent, as it were. This is part of this fellow's problem - nothing is ever enough! Hence his tendency, perhaps, towards being a bit portly. He puts weight on because he needs "just one more" of whatever it is he's eating. Of course there is an up side to this card. In many ways it is a naturally positive card. It represents wishes and is said, in traditional tarot meanings, to indicate that you will get your wish. I think it is also a card that suggests counting our blessings. Are there ever enough blessings? Of course there are! There are however many there are supposed to be - just maybe not always granted all at once! 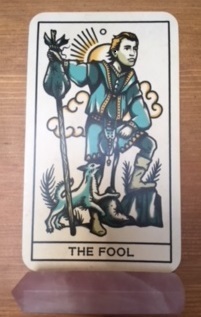 I am reminded of this card when I hear people say things like "The only thing with that is...." - and they are about to launch into a gripe about something that was otherwise pretty good. Also, when I hear someone focussing on how they were disappointed with something, whilst forgetting to focus on the good stuff. It is as though that ten percent that was "missing" suddenly becomes all important - and none of the success that those brilliant cups ought to stand for means anything at all! This card could be about satisfaction but in some ways it isn't. It is about dissatisfaction. Or lack of satisfaction. The thirst has not yet been quenched. When directed at the self it can represent a relentless taskmaster - the boss or parent who can't yet manage to say "well done that's really good" and leave it at that. They either fail to praise or have to add on "what's next?" or "and you could do better" or "now go and do X". I think that a good counter card for this would be either the Six of Wands, which shows Victory, the Four of Swords, which indicates the need for rest and a break or the Four of Wands which can mean success and taking a holiday. That's what I see in this card today. What about you? Why not share your experiences of or observations about the 9 of Cups in the comments area below? The Hierophant is a Major Arcana Tarot card, the significance of Major cards is that they flag up something of overall importance in life, as each one focuses on a universal theme. The Major cards then, are not just about the flow of trivial, day to day events, each one presents some sort of life lesson that needs to be taken in and understood. To me, this card is saying there are ways of doing things and that I need to notice where this is operating in my life and respect it. The Hierophant is typically associated with traditions, ceremonies and rituals - some examples of long-established ways of doing things. A ritual is designed to be repeated over again; a ceremony marks an occasion or links with a rite of passage. This may come with a piece of paper that marks the occasion - such as a marriage certificate. Traditions are sets of protocols with certain rules and may include social manners as well as creating a certain structure to events. Sometimes the theme with this card, therefore, is playing by the rules or accepting the procedure of filing in forms, where everything is streamlined within a system. This card used to be called The Pope in ancient Tarot decks and often bears the image of a religious authority. There is the sense here of a figurehead who is intended as God's ambassador and, ideally, a protective force. The card features two crossed keys, which symbolise entry into the kingdom of heaven - or some other inner sanctum or place of spiritual bliss. How is the Hierophant relevant to me currently? Recently, I needed to complete a form for a Tarot association that I belong to, relating to my professional status. My professional reader and tutor listings have been in place there for some time but the organisation wants to streamline the way that information is presented, so they have produced a special form which everyone must complete. I tend to naturally dislike the uniformity of forms, rules and bureaucracy. However, I see that they serve a positive purpose and are designed to protect everybody. 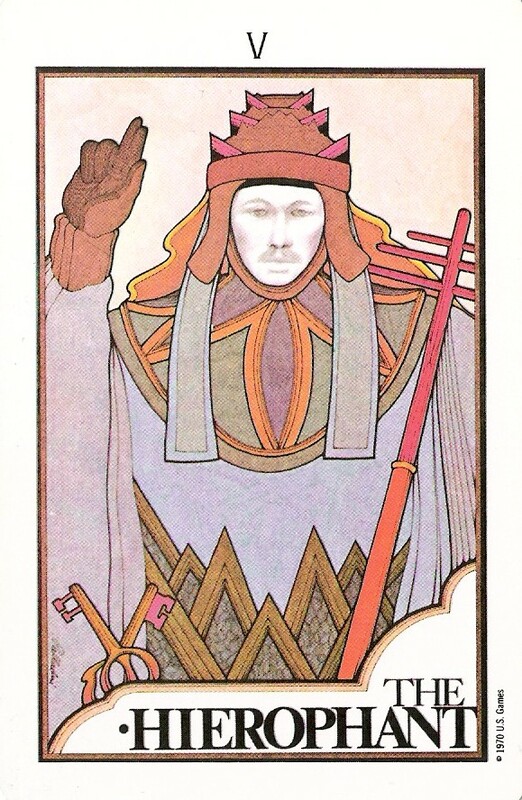 Equally, the way that the association needs to present material may fall in line with its mission statement or ethic, which are also themes that link well with the Hierophant, together with its theme of a spiritual practice of Tarot card reading - albeit not tied to the conventional religions of the day. Suggested Keywords: gateway, teacher, mentor, guide, alignment, traditions, rituals, reverence, respect, mission, doctrine, ethics, spiritual, moral, guidelines, ceremony, official forms, certificates, protocol, format, procedure, the “done thing”. Welcome to the Mindbliss Tarot Log! Why a Tarot Log? It's a blog with a difference. It is designed specfically to demonstrate a simple way of working with Tarot cards to help improve intuitive responses to the cards. It is my hope that, in my capacity as a Tarot Mentor and Tutor, I can help others in various ways to improve their symbol- reading abilities, so that divination based readings can flow more easily. This is a great place to start! If you would like more help in developing your style and connection, take a look at our Tuition/Mentoring page. Meanwhile, this log will show how to match card meanings and symbolism with everyday life events. Working well with the Tarot requires great honesty and an open heart and mind, to bring home its story. So if you try this for yourself, I suggest you do your best to try to let go of preconceptions and see what the card wants to tell you. You can of course take a look at any card in your own Tarot deck collection. I often like to chop and change the deck I work with, a method which I hope will also add some variety and spontaneity to the card readings here. If you don't want to be able to read the Tarot, but are curious as to how it works, this blog might help to give you an insight!